There aren't that many sites in Italy like High Agri Valley, a location where within a few kilometres you can find historical settings, industrial architecture and hydraulic works meshed into a beautiful environment context. Men and nature have harmonized their very best potential in lots of italian cities to create perfect compositions, as a great painter does with his works. Well, one of these extraordinary places is Val D'Agri. The Moliterno beech tree forest, the Pertusillo Lake with its Mediterranean frame and enchanting mountains, the Volturino, Viggiano Sacred Hills and the Sirino Mountain. 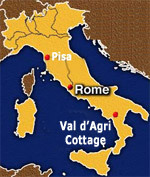 Our Bed and Breakfast Cottage is the last piece of a nature puzzle including the Val D'Agri and the Cilento Vallo di Diano National Parks. Val D'Agri has a strategic position allowing easy visits to the protected areas of the Potenza province: the Monticchio lakes, the WWF Pignola Pantano lake, the Laurenzana Abetina, and at about 20 Km from our Cottage the Laudemio lake under the Sirino mountain; a fairy tale scenery. The High Agri Valley is simply a place where nothing is less than spectacular: lakes, fields, forests, protected flora and fauna resources and several suburbs with unique character. All of this is completed by the enthusiastic hospitality of our Val D'Agri Bed and Breakfast Cottage.